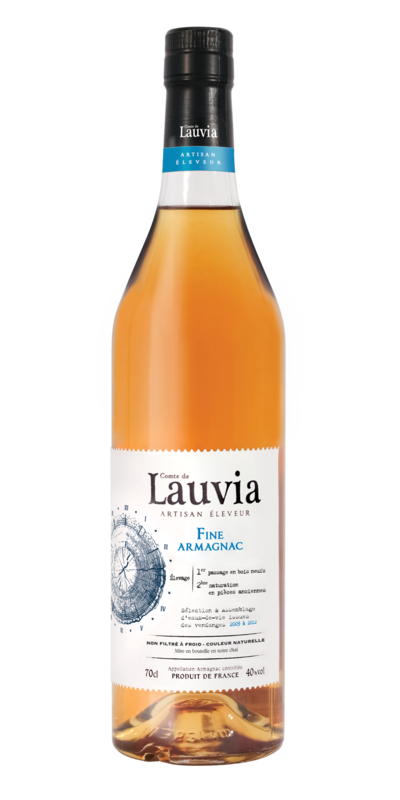 Comte de Lauvia Fine Armagnac — Emporia Brands Ltd.
Lauvia is an artisan Armagnac that starts life with a handful of top-rated wine estates in the heart of Bas Armagnac producing preferred grapes, Ugni Blanc, Folle Blanche and Back. The eaux de vie are created by micro continuous distillation on the estates, in small batches at a low temperature to retain maximum character. It is aged under the constant supervision and tasting inspection of the maître de chais Eric Durand in the famous cellars, 'The Cathedral' in Eauze, where he manages over 1500 casks, starting with up to 9 months in new local oak followed by around 2 years in second/third fill oak, and completing the harmonisation and maturation in mature oak. The maître de chais draws on his experience to create three exemplary Armagnacs, and the vintages making each blend are clearly declared on the label for each bottling. All three are expressions of the classic artisan tradition, non-chill filtered with no added colour. Nose: Vanilla, lemon and lime blossom notes. Palate: A supple and fruity feel, with a delicate and delicious finish.